Late Preclassic Period, ca. 300-100 B.C., Colima, West Mexico. This female statuette wearing a most unusual headdress, which consists of an appliquéd ‘twisted turban’ surmounted by two rows of solid pellet ornamentation, and a row of feather-like cylindrical forms in a fan-like configuration, is also decorated with appliquéd ‘cicatrice’ shoulder pellets, ear spools, chinstrap, and a necklace with a complex central medallion. She has highly detailed facial features, a burnished pinkish-beige buff, with clear remains of black painted geometric designs from her torso down to just below the knees. 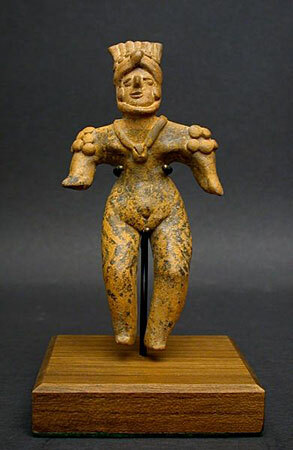 This lady is a very unique example of the Tuxcacuesco-Ortices substyle of Colima sculpture. Provenance: The state of preservation of the painted design is very rare. She has been in a museum-quality Los Angeles County collection for the past 40+ years. Condition: There is a very small chip in the backside of the necklace strand. This statuette is in otherwise excellent condition. She is delicately mounted on a custom teak stand with flexible metal braces.